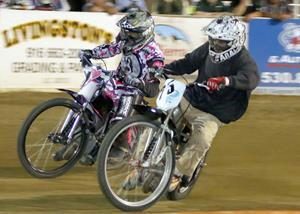 A near capacity crowd of motorcycle speedway fans filled the McCann Stadium at the Gold Country Fairgrounds Friday night in Auburn for the opening night of the 2018 Fast Friday’s Motorcycle Speedway season. 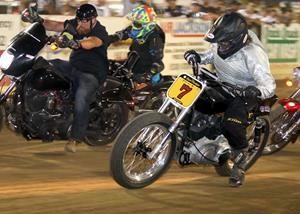 The long off season drought is over and fans were treated to a night of fantastic racing action. Many riders were back moving up to different divisions and some riders aging out of the youth divisions and now tearing it up in the adult divisions. 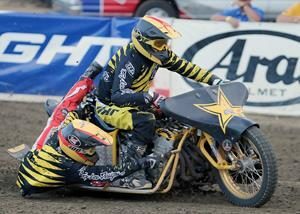 Eight time AMA US Speedway National Champion Billy Janniro was back and wasted little time climbing to the top with a convincing win in the scratch main event. 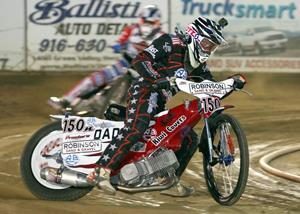 Janniro is beginning a special possibility historic season this year as he works toward being the first speedway rider in America to win nine national championships. He currently is tied with Greg Hancock each possessing eight national championship titles. 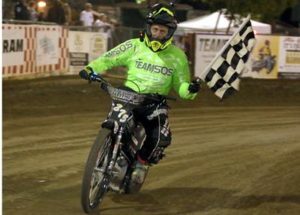 “It’s just another year racing for me, it would be nice to make that the point of my year but it’s not,” Janniro said in regarding his winning a ninth national title this season. “I’m here to win every race I’m in if I get something else on top of it that would be a bonus,” he said. Janniro faced Charlie Venegas, Tommy Hedden and Ryan Bast in the scratch main event. He got a good gate and it was really a two man race with Venegas presenting a challenge for Janniro for the first two laps. Janniro slowly widened the gap in lap three and four and cruised to his first main event Fast Friday’s victory of the year. Venegas followed in second, Bast was third and Hedden fourth. A big surprise in the Handicap main event was Auburn’s Tyler Warren who was on fire all evening holding off Janniro and Bart Bast get his first win of the season. Warren who was off all of last season had a great night, turning in some of the best riding of his career. Warren took ten yards off his 20 yard starting position with the win and will be a rider to keep an eye on this season. “I’m riding a bike I never have rode before, a GM motor, it’s small and fits me well and I feel comfortable on it,” Warren said. “I’m really excited about it (the win) I just came out and am having fun, life’s good and everything else is coming around.” Bast was second and Janniro third. Bast starts on the 50 yard line and Janniro starts the handicap program on the 60 yard line. 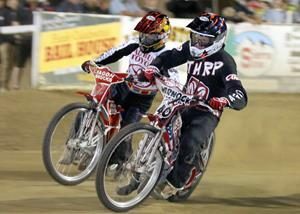 In another race Warren and Russell Green turned in one of the best rides of the night in their scratch heat race with a photo finish for second and third place that had fans on their feet cheering both riders on. Back this year in Division II and turning in a solid first night was Auburn’s Will McCloskey. McCloskey was undefeated Friday night winning his heat race and then taking the main event. Rick Shafer also had a great night finishing second and Aaron Sorani was third. Moving up from the youth division and a 250cc bike Sammy Tetrault made himself right at home on a 500cc bike winning the Division III main event. Part of the growing TeamSOS, Tetrault was second in his heat race and took the main off the 20 yard line ahead of Dakota VanderBroeder who won her heat race to advance to the main event. Steven Sagen was third. Anthony Dion topped the Youth 250cc division with a perfect night winning both his heat races and the main event. Cameron Krezman was second and Dylan Wagner was third. Charlie Trana won the Youth 150cc main event, also turning in a perfect night winning his heat races and the main event. Colton Nelson was second, Mason Zebroff was third followed by Nick Hohlbein who finished fourth. If Friday night was any indication of the coming season, it looks to be a very exciting 2018 Fast Fridays racing season. 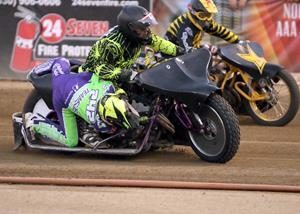 For more information on Fast Friday’s Motorcycle Speedway and the 2018 season visit www.fastfridays.com. 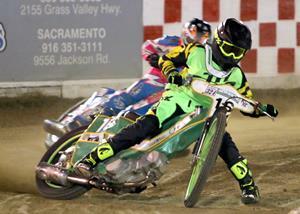 -Grass Valley’s Anthony Dion wrapped up a perfect night with a win in the Youth 250cc main event. 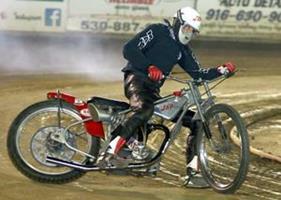 Bart Bast (left) and Tommy Hedden in a tight heat race Friday night. Coming out of turn two (left-right) Jameson Dilkey, Bart Bast and Louie Mersaroli get tight Friday night during the Fast Friday’s season opener. 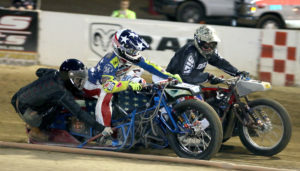 One of the best races was a scratch heat race between Russell Green (left) and Tyler Warren (right) for second and third place. Warren took second place by inches but both racers had the near capacity crowd on their feet for the photo finish. Charlie Trana won the Youth 150cc main event.